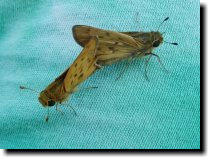 I was pruning the star jasmine when something came buzzing through the air and smacked into my shoulder. 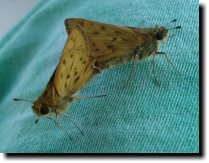 It turned out to be two skipper butterflies locked in what I can only presume was an amorous embrace. 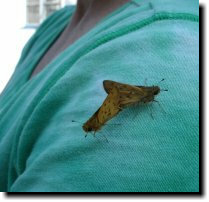 They stayed on my shoulder for another 20 minutes while I continued with yard work.